Vermont is the perfect choice for your Bicycling Vacation. Vermont offers mountain biking trails, bike tours, back road bicycling trials, and touring routes. Explore all the links below to view suggestions for a Vermont biking adventure. Find Vermont bike trails and cycling locations in every region of Vermont. Vermont is home to hundreds of miles of mountain biking trails and bicycle routes. Come to Vermont to ride, explore, and improve your mountain biking skills, take a guided bike tour, or find a dirt road and make your own bicycling route! From Kingdom Trails to Mount Equinox – find your biking adventure in Vermont. Share your Vermont biking updates or ask us about VT biking vacations. To feature your business, contact us. Vermont Adventure Tours offers half and full day cross-country mountain bike tours through-out central Vermont. Tours are for all ability levels, beginner to expert. We also offer mountain bike skill clinics. Each tour can be customized to fit your desires and to give you a great experience while you are with us. Riding skills, bike handling, exposure to various terrain surfaces, trail etiquette, and environmental impacts are all issues and topics you will learn. "Warm hospitality... the gardens are famous". Yankee Magazine. Hike or bike Kingdom Trails- a multiple-use trail system unlike any other and recently voted as the BEST MOUNTAIN BIKE TRAIL NETWORK in North America by Bike Magazine in their annual Reader's Poll. These non-motorized trails operate year-round with opportunities for all levels of ability. Relax and recharge at this country inn with resort amenities on 570 acres in Vermont's Northeast Kingdom. Offering 24 guest rooms and suites, pool, tennis, trails, petting barn, skiing, snowmobile tours, x-country skiing, hay / sleigh rides, spa, and sauna. Country breakfasts and dinners overlooking perennial gardens and spectacular mountain views. Wedding facilities. Kid friendly. Easy to get to from I-91 & I-93. Bike Vermont! Explore Vermont bicycling in every region. 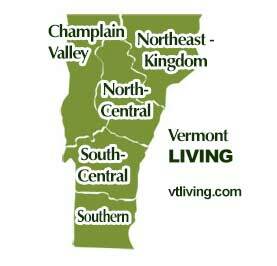 Champlain Valley, Northeast Kingdom, North-Central, South-Central and Southern Vermont.